The first love story on earth . . . Haunting . . . Lyrical . . . Unforgettable . . . In a world where everything is perfect, yet the same day after day, Eve must decide if she wants to live forever in the garden with Adam and never know what lies beyond the walls. When she makes a choice with terrible consequences, the pain of mortality is swift. As she and Adam explore their new world, and her body changes, Eve discovers the sweetness of first love with the man who has always been at her side. Author H.B. Moore is best known for her stories of Biblical women. 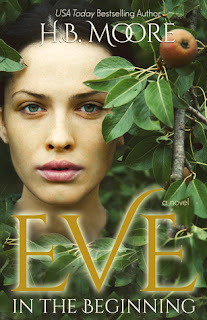 This time, she has tackled the story of Eve, the world's first mother. The story opens with Adam and Eve in the idyllic surroundings of the garden of Eden. The tree of knowledge exists nearby, but Adam is adamant that they must never eat of the fruit. From that point on, Lucifer appears in human form and tempts Eve which results in her and Adam being evicted from the garden. Outside, they struggle with life including a miscarriage, a horrific storm, and the daily struggle to survive. The story is written in first person narrative. Eve is curious about the world around her, but she is also a bit naieve. Of the two, Adam is the stronger, not only physically, but also faithfully. And of course, Luther makes his appearance as their main villain throughout the story. This is a lovely imagining of this most important biblical woman. The author writes succinctly and simply, making it easy for all levels and ages of readers to enjoy. Well plotted, and interesting throughout, I found this a nice tale to relax with, yet with enough depth to make me ponder some more profound topics such as trust, love, fear, and faith.